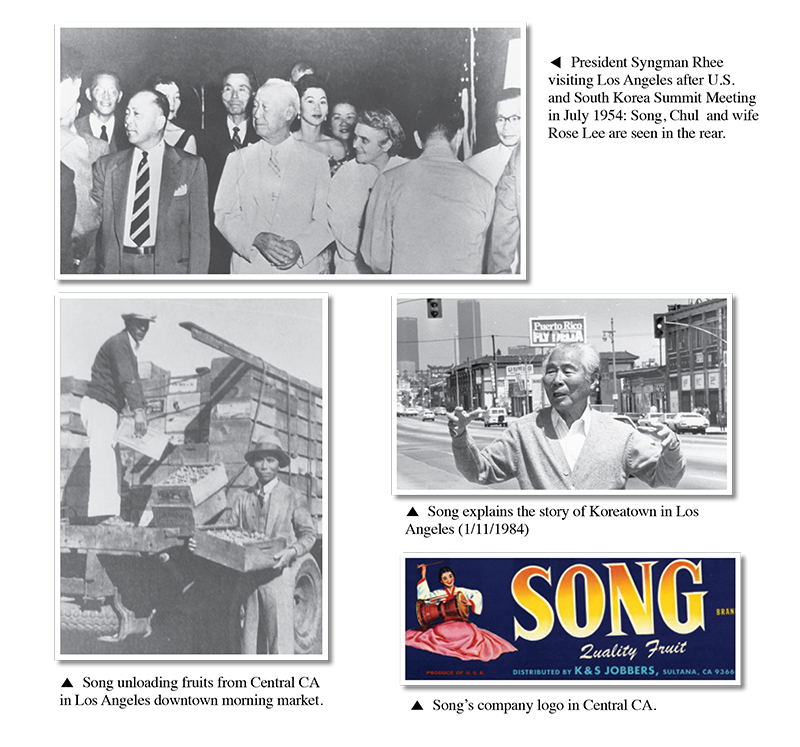 Song, Chul: He was a life-time backer for Syngman Rhee’s Korean independence. His adoration and respect for Dr. Syngman Rheee was unmeasured as he selflessly dedicated his entire life for Rhee’s Korean independence cause. He was born when the Tonghak Rebel- lion erupted. He heard Syngman Rhee’s speech when he was a junior high school student. Leo Song was deeply touched and impressed when Syngman Rhee said: “There is no servility in learning. You can create a new Korean national history when you are burning the midnight oil.” This speech hugely impacted this young man. He determined that he would succeed like Dr. Rhee and he worked hard. He arrived in Honolulu in 1917. He personally visited with Dr. Rhee’s office. Dr. Rhee was 42 and Song, Chul 23 when Dr. Rhee said: “You will be an important pillar for the Koreans when you study a lot.” He re-entered a senior high school and proceeded to UC-Berkeley. Later, he opened up a business with Kim, Yong-joong in Dinuba and continued to work for the next 60 years. He donated the sum of $1,500 to the In- dependence Hall of Korea. Prior to his demise, he authored: “Song Chul’s Reminiscences.” He passed away in 1986 at the age of 93. He is buried at the Inglewood Cemetery. He is survived by his wife Rose and three sons: Leo, Eugene and Gary Song. In 1994, the South Korean government posthumously recognized him with the Order of Merit of the National Foundation / Patriotism Award for his service for Korean independence movement.